1．Works with Any Wi-Fi Routers. 2．Simply update your Desktop/PC/Laptop can receive 802.11ac Dual Band wireless signal. 3．Auto-detects and changes the network transmission rate. Maximum speed up to 5GHz 867Mbps or 2.4GHz 300Mbps. 4．Supports soft AP Mode to establish your wireless LAN networking. 5．Mini size design, space saving and easy to carry. 6. Added antenna to increase WiFi coverage. 7．Easy to use, once you've installed the CD and run the software, you can simply insert the adapter to get connected. 2.No driver needed for Windows 10. Other systems, before plugging the wireless network adapter into the usb port, please FIRST install driver via MINI resource CD disc. Once you've installed the software, you can simply insert the adapter to get connected. 3.Create a hotspot with the soft AP mode: whenever there is only wired Internet connection, you can activate the AP function after installing the included CD software, and create a Wi-Fi hotspot for other Wi-Fi enabled devices, including laptops, smartphones or tablets. HIGHEVER Wireless USB dongle is backed by our 18-month limited warranty. 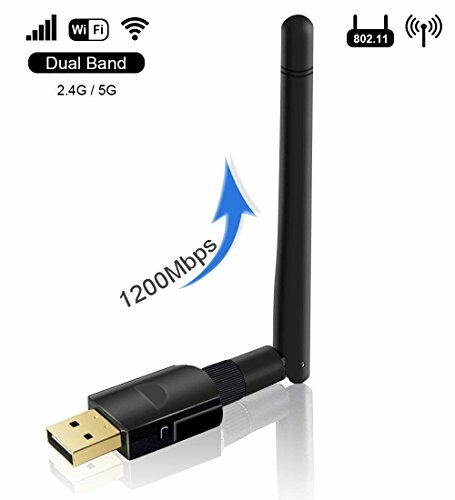 [HIGH SPEED 1200Mpbs]: Ultra-fast AC1200 wireless adapter speed with 802.11ac. Speed up to 5.8GHz (867Mbps) or 2.4GHz (300Mbps). Performance to reduce freezing and lags when streaming and gaming. [STABLE WiFi SIGNAL]: High Gain Long-Range 3dBi Antenna can help you connect even when signals are weak and offer you a better stable WiFi signal experience. [100% Satisfaction Guarantee]: Please confirm purchase from HIGHEVER. HIGHEVER Provide 90 days replacement service And lifetime warranty, so you needn't to worry anything. If for any reason you're not completely satisfied, please contact us with your questions, we will help you within 24 hours. [Two Modes & WPS Function]: Receive wireless network signals in station mode or create a wifi hotspot in AP mode. WPS (Wifi Protected Setup) encryption function keeps your wireless network security.